This month’s lunar cycle* reminds me of a comet. Comets are born in the dark regions at the edge of our solar system. They begin as balls of ice and rock floating in a dark womb, waiting to be nudged into heat and light. As a comet gets closer to the Sun, it begins to glow as it throws off a tail of ice particles. 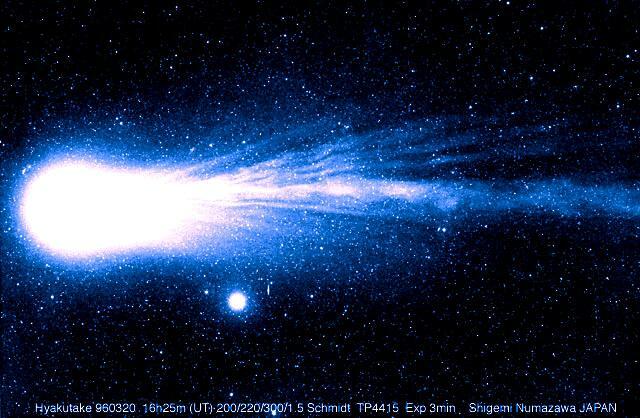 A comet is an awe-inspiring visitor from the dark edges, streaming with light. That’s a good metaphor for a lunar cycle that began in Cancer’s nurturing, dark waters and is now blazing through the heavens with Leo’s Sun-fueled glow. There is a connection between our dark places and our brilliant lights. This comet metaphor can perhaps inform us of that connection. The opportunity this lunar cycle is to feel into the large expanse between interior needs and exterior expressions. We are like comets, nurtured by Cancer’s desire for home and glowing with Leo’s desire to shine. Have you felt that stretch in your life? The theme of the relationship between dark and light is reinforced by the square between Jupiter in Leo and Saturn in Scorpio (fixed water) that is influential right now (exact on August 3). These two planets have a 20-year cycle of interaction. At this phase of the cycle, Jupiter is moving towards Saturn in the waning square, which is about reaping the wisdom of the last conjunction in Taurus (fixed earth) in 2000. Simply, Jupiter represents expansion and Saturn contraction. Metaphorically, this feels a lot like the evolutionary action of water, expanding in the heat and freezing in the cold. Repeated over time, landscapes are transformed by these forces. We are too. Something solid, represented by Taurus, is being transformed. Over the last 15 years a lot has shifted. With the current positions of Jupiter and Saturn, we sense shadows and lights being released. If we can resist the idea that Jupiter/expansion/light is better than Saturn/contraction/shadow, we have an opportunity to be in better relationship to the Earth, our bodies, and our values (Taurus). Saturn stations direct this week, preparing to leave behind Scorpio intensity for the Sagittarius (mutable fire) quest for meaning in mid-September. Intensity and pressure increases this week. Illumination and release is offered by a Full Moon in Aquarius on July 31. Even with the reminder that darkness is the birthplace of light, the need is to shine and let off some pressure. Look for affirmations and send them out to others who also need to be seen and appreciated. Notice the exchange of life-force energy when generosity and gratitude are expressed. The resource of fire/energy/creativity (Leo) is renewable and sustainable when it is shared in community (Aquarius). The balance of being the light and reflecting the light is the blessing of this Full Moon. July 27—Gibbous Moon: Perfecting. Perfection implies completion. Once we’ve attained perfection, there really isn’t any more to do. Perfection isn’t what this phase of the Moon is about. The energy of the Gibbous Moon is one of pushing ourselves closer to manifesting our intentions. The potential of this lunar cycle is about the life-affirming energy of the Sun, the ruling “planet” of Leo. There are many ways to invite this solar light into our lives. Falling in love, creating beauty, being the biggest fan ever of another’s creativity, dancing with abandon, daring to believe in yourself … really, this list just goes on. What creates life-force energy for you? Pay attention to how it feels in your body. Push yourself a little farther towards that. The Moon in Sagittarius (mutable fire) is adventurous. Take advantage of that boost of curiosity to go past a new edge. Mercury in Leo (fixed fire) makes a quincunx aspect to Neptune in Pisces (mutable water), setting up an interesting paradox between selfhood and selflessness. We tell ourselves a lot of stories about taking up too much room, being too needy. The pull between Mercury and Neptune can help us see the full range between personal desire and collective needs. What if we took judgment out of the equation as we decide which impulse to follow? Tuesday, July 28. This is a good day to get some work done, especially in the realm of long-range plans. The Moon in Sagittarius (mutable fire) is boosted by its contact with Jupiter in Leo (fixed fire) in the morning (CDT). The phrase “Carpe Diem” is made for this type of expansive energy. Then, the Moon shifts into serious-minded Capricorn (cardinal earth) and makes another delightful contact with retrograde Venus in Virgo (mutable earth). Let beauty influence the choices you make to get your life in order. Wednesday, July 29. We may want to look more closely at power dynamics in our relationships and groups today. The Moon conjoins Pluto in Capricorn (cardinal earth), and Mercury in Leo (fixed fire) makes a quincunx to Pluto as well. Fire signs are not particularly good at keeping their opinions to themselves. Our tongues are loose with Mercury’s transit through a fire sign this month. The tendency is to blurt out what we really think about corrupt power or to tell a secret that upsets the status quo. Find the best way to express yourself, thinking about possible ramifications. Thursday, July 30. The Moon in Capricorn (cardinal earth) reminds us of the recent square between Mars in Cancer (cardinal water) and Uranus in Aries (cardinal fire), which may have sparked some fireworks in your life. The impetus for change comes from a desire for safety and intimacy. If those pieces are missing, you look again at the changes needed to bring them into your life. Structure becomes an important ingredient. 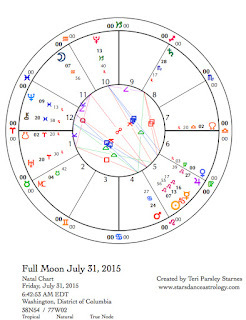 When the Moon moves into Aquarius (fixed air) we start to feel tomorrow’s Full Moon tension and desire for release. The realm of ideas is beckoning. 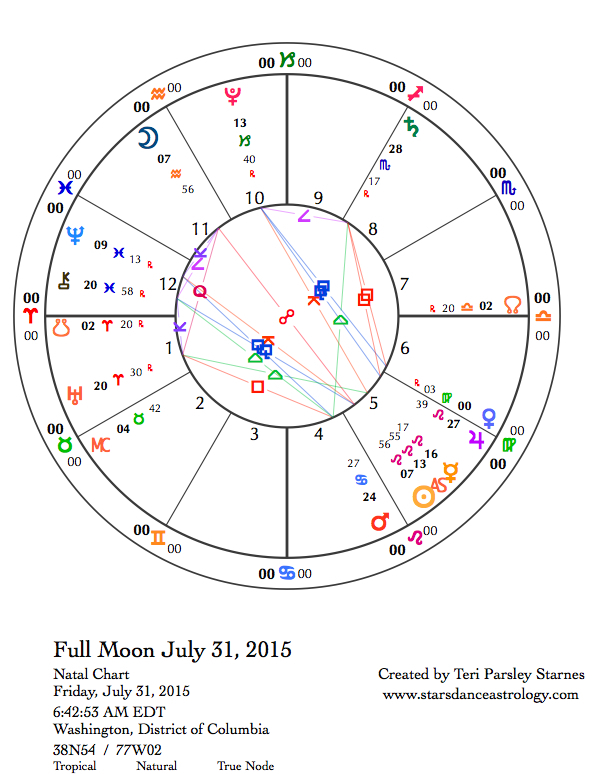 July 31—Full Moon: Illuminating. Sometimes the quest for self-worth can feel very lonely. I have a friend who describes this quest as the self-reflecting question, “What is the point of me?” But truly the search for “the point of me” doesn’t have to be lonely at all. Moving the gaze from ourselves to the groups and communities we belong to helps give perspective on the point of everyone. This is the gift of the Aquarius Full Moon. Aquarius (fixed air) helps bring balance and perspective to the Leo (fixed fire) quest for relevance. The truth is everyone needs to feel they are relevant to the group. This impulse is one of the reasons we form communities, to find the people who most get us and appreciate us for who we are. Jupiter is nearing the end of its year-long transit of Leo. This transit is an opportunity to trust our instincts around energy and to believe that the awareness of aliveness in everything can help guide us toward making choices that feel joyful and life-affirming. This is the promise, but it doesn’t come easily. Jupiter is squaring Saturn in Scorpio (fixed water). This challenging relationship between aspirations and reality helps us to round out our instinctual awareness about what feels joyful and sustainable. Compromises need to be made. If Leo is about the power of life-force, Scorpio is about the power of confronting the shadow. How well do these qualities play together in your psyche? Venus just recently stationed retrograde at zero Virgo (mutable earth). Today, Venus moves back into Leo where the planet of love and beauty will spend the next few weeks (until October 8) in the sign of romance, courage, and joy. Venus meets Jupiter again on August 4. (The first time was July 1.) The meeting of the two benefics in Leo gives a boost of life-force energy. Recently, in a Nia dance class, we joyfully spread our arms as we danced with our arms spread wide to the Coldplay song, A Sky Full of Stars . I couldn’t help thinking this was how it feels to let the joy of Leo move through my body and soul. With Venus and Jupiter’s support, try it—stretch yourself and dance like a star. Saturday, August 1. It isn’t easy being a star (see yesterday’s Full Moon forecast). Reality hits today with a tense t-square forming between the Moon in Aquarius (fixed air), Jupiter and Venus in Leo (fixed fire) and Saturn in Scorpio (fixed water). Not everyone is ready or willing to be generous with their support. Saturn holds the reins of approval and the criteria is that we turn to a deeper source for our creativity. The life-force fire is still there, but it benefits from acknowledging complexity and holding ourselves accountable for impact. Another pressure comes from the paradox presented by Neptune in Pisces (mutable water) and the Sun in Leo (fixed fire). Can water and fire mix? When the Moon enters Pisces this evening (CDT), we benefit from finding time for calm reflection. Sunday, August 2. The Sun is putting its rosy hue on the first fruit at this mid-summer holy day of Lughnasad. This is the celebration of first fruits and is a wonderful time to express the Leo qualities of generosity and gratitude for the fruits of your life. Saturn in Scorpio (fixed water) stations direct today lending sobriety to the celebration. This is the last pass of Saturn through Scorpio. Anyone with planets in the late degrees of the fixed signs are reaping the fruit of Saturn’s transit through soulful Scorpio. The work may have been hard, but worthwhile. Mercury in Leo (fixed fire) makes a trine to Uranus in Aries (cardinal fire). There is little to impede our thoughts and words today. Creative energy towards change is possible. It is good to include compassion in our thoughts as Mercury forms a quincunx aspect with Chiron in Pisces (mutable water). The Moon in Pisces supports the intent to sense and feel more globally and compassionately.